We have just a prototypical Second Round sweep here. The higher seed basically won every statistic. The 12th-seeded ’84-’85 Philadelphia Flyers offense truly was led by the two mentioned in the title. Brian Propp totalled 12 points during the series, both a series and team-high. Big Tim Kerr finished with 10 points, second only to Propp. 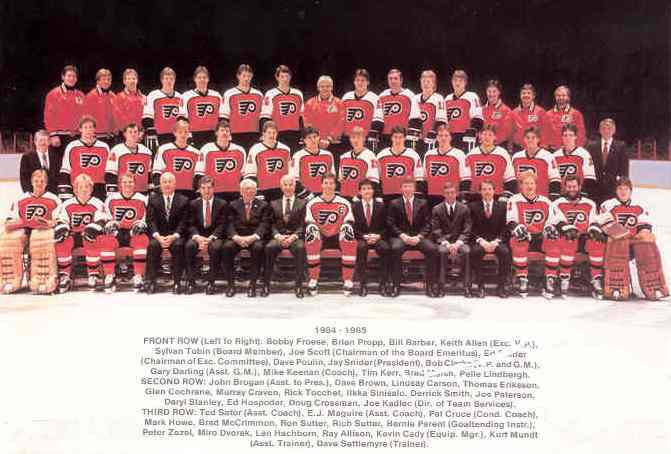 Four other Flyers did finish the series averaging at least a point per game, which included Kerr and Propp’s linemate, Dave Poulin (7), and superstar defenseman Mark Howe (7). Kerr also had a series-high seven goals and Propp, of course, was second with four goals himself. The series couldn’t have gotten off to a better series for Big Timmy Kerr as he scored four goals in Philly’s 7-2 win in Game 1. Propp also led Philly in assists with eight while defenseman Brad McCrimmon was second with five. In goal, Pelle Lindbergh was a bit sub-par to his standards. Yeah, he backstopped a sweep, but he posted a 3.25 goals against average and a .904 save percentage. The 21st-seeded ’80-’81 St. Louis Blues’ offense naturally took a step back from their performance in their First Round series. They only scored 13 goals during the series, but three of those did come on the PP where they only had 7 opportunities. So, they posted a PP of 42.9%, which is pretty good. Wayne Babych led the Blues in goal scoring, again, with three goals during the four games. There was a three-way tie for second at two goals between Bernie Federko, Mike Zuke and defenseman Rick Lapointe. Jorgen Pettersson led St. Louis in assists with four while Blake Dunlop was second with three. Babych finished the series with five total points to lead the Blues in overall scoring. Dunlop, Pettersson and Zuke all finished with four points to tie for second. Goaltender Mike Liut had a dreadful series. To go along with his 0-3-1 record, he finished the series with a 5.25 goals against average and a horrid .854 save percentage. The ’84-’85 Flyers are the third different team to represent Philly in the Ultimate NHL Playoff. After a terrible inaugural UNP where the franchises rep was ousted in the First Round, last year’s rep made up for that by making it all the way to the Semifinal, where they were eliminated by the eventual UNP champions. In the Third Round, the ’84-’85 Flyers will face the 5th-seeded ’12-’13 Chicago Blackhawks, who defeated the 28th-seeded ’72-’73 Minnesota North Stars in the Second Round. The ’80-’81 Blues are also the third different team to represent St. Louis in the UNP and all three have now been eliminated in the Second Round after advancing from the First Round. Up next in the Second Round, we have a rematch of the franchises who featured in the most recent Stanley Cup Final, as the 8th-seeded ’92-’93 Pittsburgh Penguins face the 25th-seeded ’09-’10 San Jose Sharks! This entry was posted in 2nd Round, Ultimate NHL Playoff and tagged Bernie Federko, Blake Dunlop, Brad McCrimmon, Brian Propp, Dave Poulin, Derrick Smith, Jorgen Pettersson, Mark Howe, Mike Liut, Mike Zuke, Pelle Lindbergh, Philadelphia Flyers, Rick Lapointe, Second Round, St. Louis Blues, Tim Kerr, Ultimate NHL Playoff, Wayne Babych. Bookmark the permalink.